The clinic’s success facilitated the need to expand. More parking, a covered drop-off, additional office space, a larger pharmacy, and a more spacious waiting room were needed. We maintained the design attributes of the original structure including the playful placement of punched openings, use of scored block and metal panels. 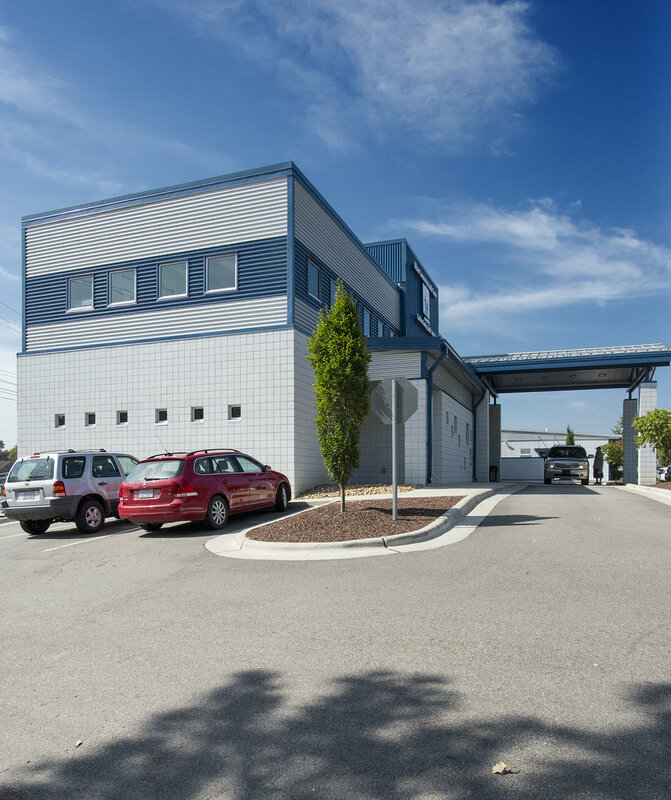 Utilizing additional properties adjacent to the original clinic, the main entrance was relocated to the new building where parking was also added. 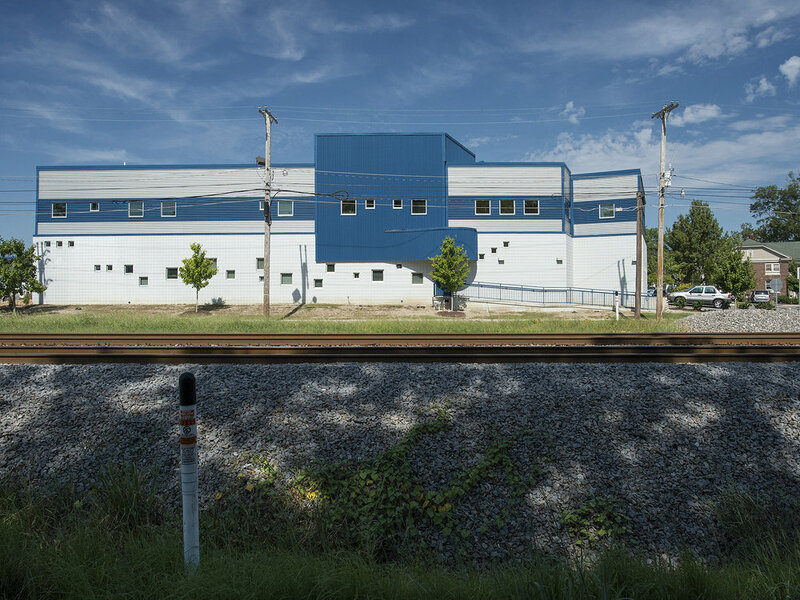 The building angles in deference to the main train line that separates downtown Wilson from the residential area to the East allowing maximum space for parking. 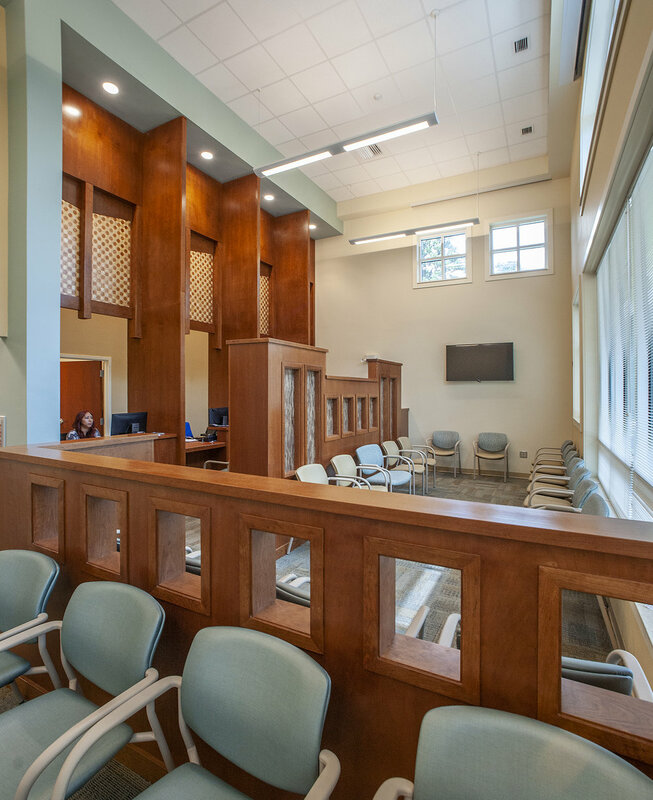 We designed the original Wilson Community Health Center clinic building that was completed in 2005. 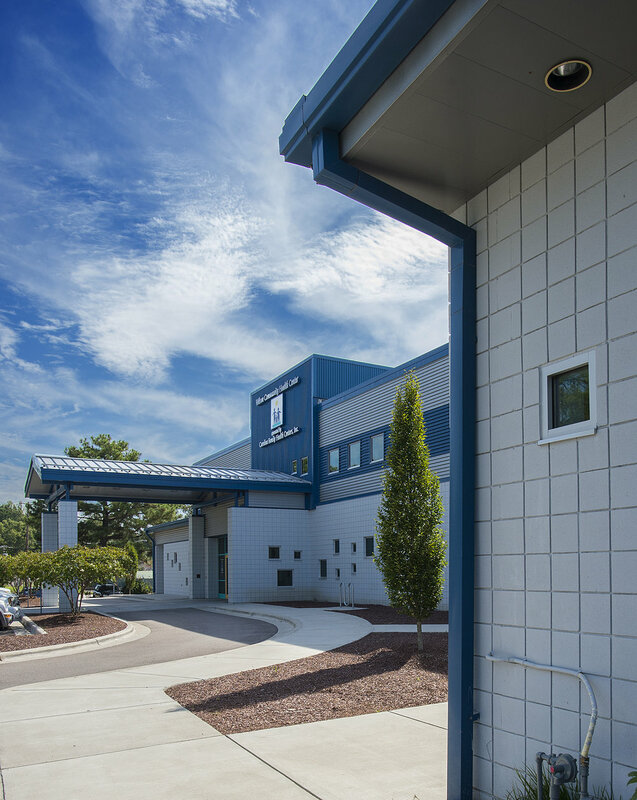 This facility won a merit award from the Eastern Section of the NCAIA in 2006. The current project for the addition and renovation was completed in 2015. The finished facility is 31,461 SF with 17,775 SF being new construction. The 2005 clinic building was also renovated (4,523 SF). This building had to be designed in a way that allows full use of the facility during construction of the new building. Careful site placement and building configuration facilitate a functional flow of patients as well as security for staff. The pharmacy is strategically placed to allow it to function independently for staff and very conveniently for patients. The new 2-story addition is constructed from load bearing masonry walls with bar joists supporting a concrete deck. The rooftop mechanical unit is concealed from view by an extension of the metal panels. The connection between existing and new construction was kept small to minimized shoring of the existing structure. 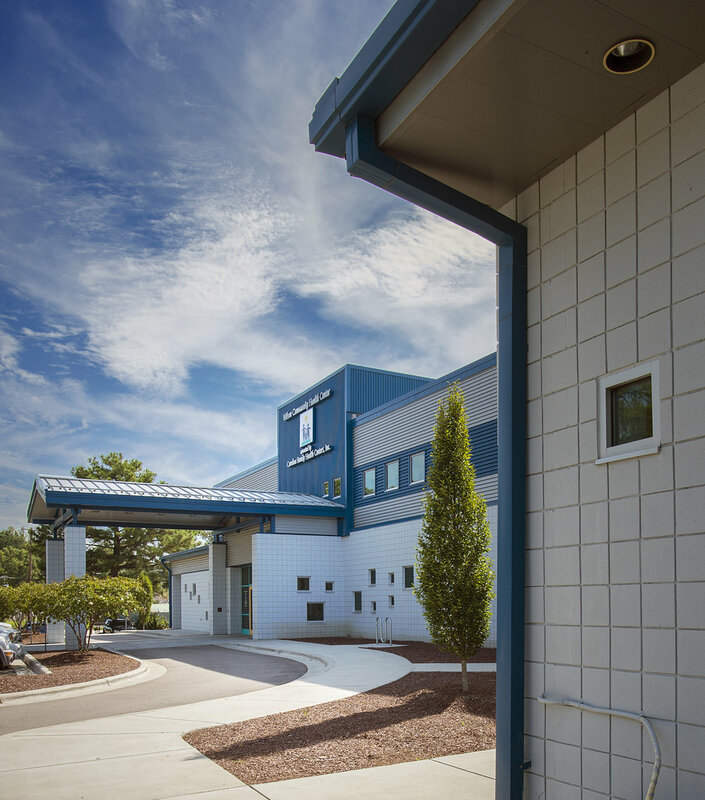 The site is located at a junction between a residential district where many of the clinics patrons reside and Wilson’s downtown /warehouse district. It is surrounded by urban streets on all 4 sides and is bounded by the main rail line to the southeast. The train station is located to the south of the site and to the north is the Old Wilson Historic District. Sustainable features include locating the building on a dense urban site that was previously developed and is very well connected to the community that it serves by walking, bicycling, and public transportation. The site features water efficient landscaping and the impervious area was actually decreased with the addition. Windows provide natural light and views while an energy efficient mechanical and lighting system were employed. A large portion of the exterior is covered with metal panels that have a very high recycled content. A modern cancer center is a place where people go to fight for their lives. Health care providers, using the latest scientific discoveries, aid in that battle. By its very function, a cancer center is a stressful place. It is also high tech place. Some patients may be comforted by technology, but others are frightened by that same technology. For an architect, designing such a place is a balancing act. Patients and family members are going through one of the most stressful times of their lives. Even for physicians and caregivers, this is a tension filled workplace. Just as the Hippocratic Oath states to do no harm, the building should not add to the patients stress level. Experientially, the building should do all it can to have a calming influence. What are some ways as an architect, we can help reduce anxiety? Provide clear circulation patterns so that a patient knows where they are going and where they have been. This can be especially difficult if the facility is located within an existing building that has changed over time and has circulation patterns that are circuitous and maze-like. Provide queues to where a patient is within the facility but providing views to the outside as much as possible. If you can’t look out windows, provide other queues such as clerestory, skylights, or use colors or floor patterns. Provide views back to waiting areas or entrance points. 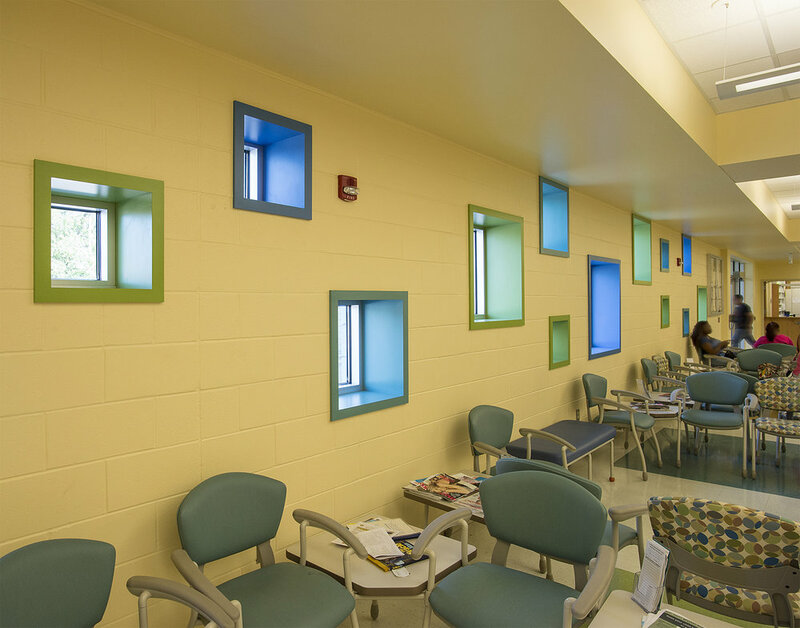 Acoustics – reduce unwanted noise, consider acoustics as it relates to patient privacy, provide soothing music, etc. Lighting – provide non-glare producing fixtures, soft light, and warm colors – only use light sources that have a high color rendering index (CRI). 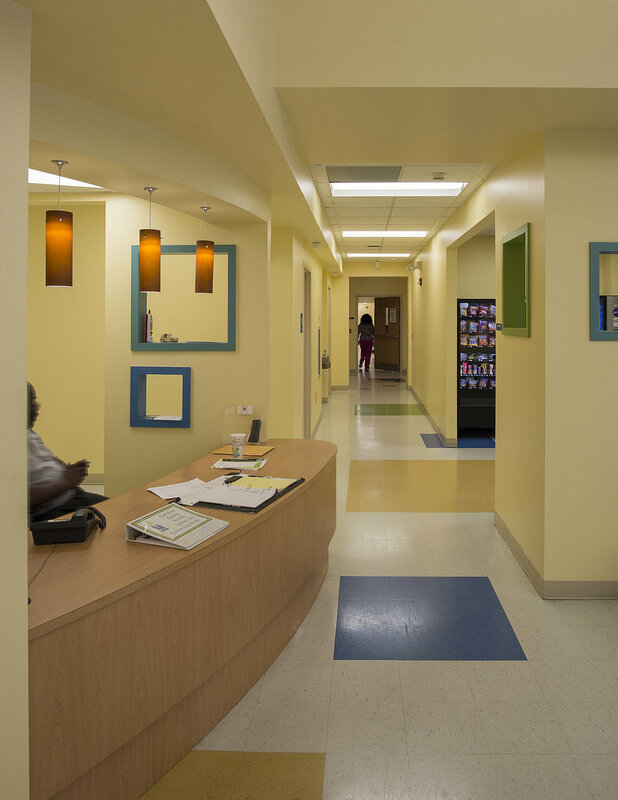 Consider using full spectrum LED lighting in treatment areas to provide a calming effect. Use comfortable surfaces, fabrics, furnishings, etc. Make the treatment areas very functional. 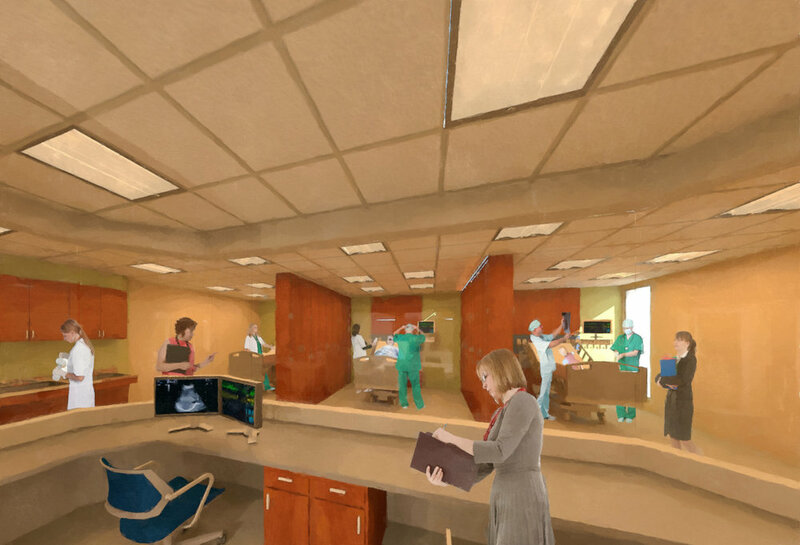 Study patient flow, treatment times and numbers of patients seen daily and make the build flow in a way that keeps treatments smooth, efficient and calm. 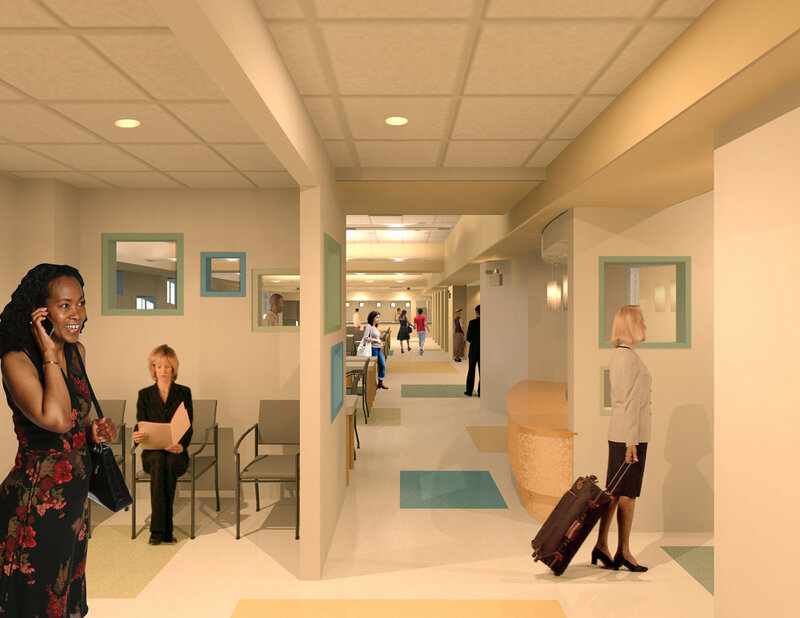 One way this might be accomplished is by providing a separate circulation area for physicians, nurses, and staff, so that they can easily flow in and out of treatment & consultation areas without distractions between patients. As with any project, an architect has to do their best to empathize with all the buildings users. The more we can do this, the more successful our projects will be. Here are some new photos of Southeastern Health's newly-renovated, 10,000 sf space for Medical Education. 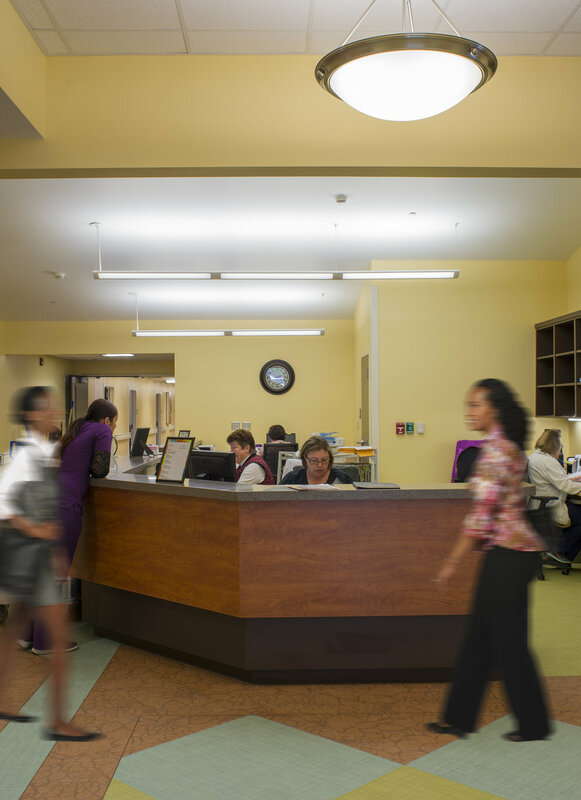 Located on the 4th floor of the administrative wing in the medical center, the space is the education hub for Southeastern Health. Offering student lockers, a 100-seat classroom, a small classroom, an electronic medical library, a resident/student lounge and meeting room, as well as administrative offices for the Medical Education department. This space is being used in a partnership between Southeastern Health and Campbell University. Click HERE and HERE to learn more. The education wing was made possible through grants from The Duke Endowment, The Golden LEAF Foundation, North Carolina Department of Commerce, and The Cannon Foundation. SLH was happy to sponsor and participate in the SeHealth Foundation golf tournament on May 26th at Pinecrest Country Club in Lumberton. The wind really blew making the course challenging, but the rain held off and everyone had a great time!